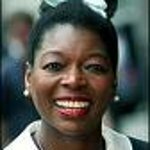 British actress Floella Benjamin runs annually in the London Marathon for the children of Barnardos. She did the Great Wall of China trek in 2004. Benjamin was entered into the National Society for the Prevention of Cruelty to Children's Hall of Fame in 2008. Google trends for "Floella Benjamin"
We don't have any news stories about Floella Benjamin. We don't have any videos related to Floella Benjamin.